The SunEdison stock price crash escalated today (Monday) as investors continue to flee their positions in the beleaguered solar energy company. The SunEdison Inc. (NYSE: SUNE) stock price plunged 53% to $0.20 Monday morning following reports the company plans to file for bankruptcy protection in the coming weeks. The SUNE stock price is now down 95.7% year to date. Its market cap, which stood at nearly $10 billion in July, has dwindled to just $56.6 million. According to a Sept. 30 regulatory filing (the latest available), its debt load is about $7.9 billion. According to reports, the Missouri-based company is preparing a chapter 11 filing and is in talks with two creditor groups to obtain a loan to fund its operations during the process. Creditors are expected to take control of the company and its portfolio of power projects. A SunEdison bankruptcy would land on the list of the largest financial collapses in recent years. The company got there via an overly ambitious combination of financial engineering and cheap debt that allowed it to grow into one of the country's biggest developers of renewable power plants. SunEdison stock's unraveling began in late 2015 when the company stopped paying some contractors and suppliers. Clients all over the country are in line waiting to collect payments and supplies. 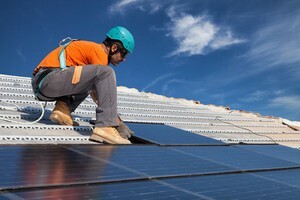 SunEdison's struggles grew last month when its proposed $1.9 billion takeover of residential-rooftop installer Vivint Solar Inc. (NYSE: VSLR) was terminated. The Vivint deal was called off after banks backed away from providing funding for the deal. At least four other takeovers SunEdison planned last year were later canceled or renegotiated. The SunEdison stock price has also crashed because of plunging oil prices. When oil prices are lower, demand for solar power decreases. That can cause major drops in solar stocks. But SUNE stock had also been under pressure as the company tried to grow quickly via acquisitions and burned through cash. The SunEdison stock price fell more than 64% last week alone following news that the company is facing U.S. Securities and Exchange Commission and Justice Department investigations. The Wall Street Journal reported last week the SEC is investigating whether SunEdison misrepresented its cash position to investors as its stock collapsed. Facing a critical cash crunch, SunEdison has reportedly been meeting with creditors to negotiate a loan to see it through bankruptcy. But competition for the deal among lenders has delayed an agreement. Creditors often compete to provide bankruptcy loans because they are relatively safe since they rest atop the pecking order for repayment in chapter 11. They also carry higher interest rates and allow the lender to help set the rhythm of a bankruptcy case. Deutsche Bank AG and hedge funds are said to be interested in the distressed assets. A SunEdison bankruptcy filing would be troubling for its two yieldcos: TerraForm Power Inc. (Nasdaq: TERP) and TerraForm Global Inc. (Nasdaq: GLBL). A yieldco is a company formed to own assets that generate cash flow. The two entities, which own power plants and sell energy to utilities under long-term contracts, are in much better financial shape than SunEdison. Still, both depend on SUNE for many services. The units are not expected to file for bankruptcy protection, but their shares represent much of SunEdison's value. SunEdison's collapse is a huge setback for the yieldco corporate structure, which was deemed a breakthrough for energy financing. SunEdison and its peers floated such vehicles that raised public funds to buy power projects from their sponsors. The appeal is yieldcos' high dividend payout, which is attractive in a yield-starved environment. But a notable shift to value investing has tempered much of the enthusiasm yieldcos initially enjoyed. Thursday, SunEdison confirmed the SEC probe and said it had received a subpoena from the Justice Department. Under investigation is whether a SunEdison employee acted improperly in takeover negotiations with Vivint. The DOJ also is looking into transactions between SunEdison and its yieldcos.